Raiders currently sit in 6th position having played 15 games on 15 points whilst the Bison are in 5th position with 16 points from 12 games, a home victory will continue the rise of the Herd up the league table. On Sunday night the Herd face travel to London for the first time this season to face Streatham with face off being 18:45. Saturday�s game starts at 6.30pm with doors opening at 5.30pm. 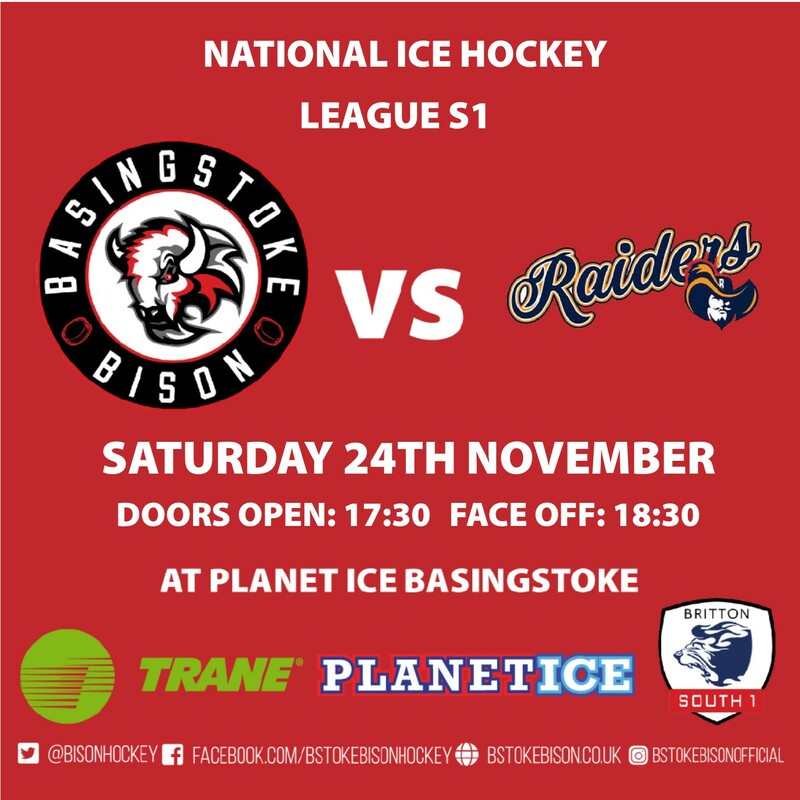 Looking ahead to the weekend games Bison player/coach Ashley Tait said: �Games against Raiders and Streatham are tight affairs and we have to look to win these fixtures in order to continue our climb up the table. We know that both teams will come and play hard and we are under no illusion that we have to be at the top of our game and put on good display for the fans in order to get the win�. Aaron Connolly � Forward and Captain � 25 year old Aaron is well known to Bison fans having been the herds team captain for the last 3 years. Born in Northfleet Aaron has played 13 games this season in the NIHL and has scored 10 points and 6 minutes in penalties. Aaron has represented Great Britain at U18 & U20 level. After his summer move to Romford in the summer Aaron has been made the captain of the Raiders. Blaho Novak � Forward � started his senior ice hockey career in Chelmsford before spells abroad in the Slovak Under 20 League.The 25-year-old returns to UK hockey having played last season in Czech Division two playing for HC Topolcany and in 2016 / 17 in Norway for Moss. His previous spell playing in UK hockey was during 2014 / 15 & 2015 /16 when he iced for the Telford Tigers where he scored 67 points (33 goals and 34 assists) whilst also being apart of the Tigers league and cup successses in the 2015 / 16. Filip Sedivy � Forward � signed as a late replacement for Martin Jakubek and since making his Raiders debut has played 6 games scoring 6 points (2 goals and 4 assists). Slovakian, Filip was born in Trencin and spent his junior career with Dulka Trencin, Prievidza and finally HK Bulldogs Trencin where he scored 94 points in 37 Games. He then headed to North America where he iced in the Atlantic JHL with the Washington Nationals, before moving to the Alliston Coyotes in the Greater Metro Hockey League. With the Coyotes he scored 36 goals and 71 assists for 107 points in 48 games. Sedivy then moved back to Slovakia, where in three seasons he played for HK95 Povazska Bystrica, HC Topolcany and HC Detva � he netted a total of 12 goals and 27 assists for 39 points in 89 games and was part of the Slovakian Division Two championship winning team during his time at HC Detva. Last season he played in Germany Division Four, scoring nine goals and 16 assists for 25 points in 27 appearances for Soester EG.